Had the rather disappointing email earlier today that informed me that I was not one of the 175 ‘random’ (yeah right) fans that would have the opportunity to ask NFL commissioner Roger Goodell some direct questions the day before the Broncos play the 49ers at Wembley on October 31. 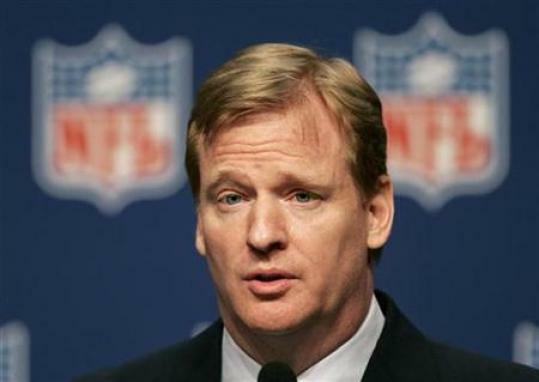 Unfortunately because of a huge flood of applications to meet NFL Commissioner Roger Goodell and participate in a Q&A with him on Saturday October 30th we could not accommodate your request to attend at the present time. The event was heavily oversubscribed, and we randomly chose 175 people to attend. We have asked that any of those that were picked that now cannot make it for any reason let us know as soon as possible so that we can invite some of you that missed out to take their place. On Saturday afternoon there will be an opportunity to hear the Commissioner speak and answer some of the type of questions that you sent in, when he is interviewed at the NFL Fan Rally event in Trafalgar Square. The interview will take place within the first hour of the Fan Rally – which starts at 1pm – so come down early to see him along with NFL greats Jerry Rice, Roger Craig and current 49ers head coach Mike Singletary, as well as music and entertainment. Click here for further details. We hope to see you at Trafalgar Square on Saturday October 30th and also at Wembley for the 2010 NFL International Series game between the 49ers and Broncos on Sunday. Thank you again for your application to meet the Commissioner and please accept our sincere apology that we could not fit you in. Polite yes, the complete truth? Not sure about that. 1) What % of likelihood is there to move the Jacksonville Jaguars to England? 2) How far do you think you will cripple the global growth of the NFL if there is a player strike in 2011? 3) The World League failed, NFL Europe failed, what makes you think there is a future for the NFL in England? 4) Did you know you need to have TWO SEPARATE satellite television contracts to watch Sunday NFL games and Monday Night football? 5) Any plans to introduce the NFL Sunday ticket onto a European satellite audience? 6) Which player or players are in your eyes the ‘Face’ of the NFL in 2010? 7) Why do you give players who take drugs a second chance and why did you let someone who fought dogs to death back into the league? Just because he can effectively scramble does not make Michael Vick the comeback player of the year. 8) Are there any NFL team who refuse to come over to play in England? 9) How likely is it that we move to an 18 game regular season? 10) What was it like the first time you picked up an NFL football and saw YOUR signature on it? Come on Roger – we want answers!